été 1944, les alliés affrontent les allemands en France. 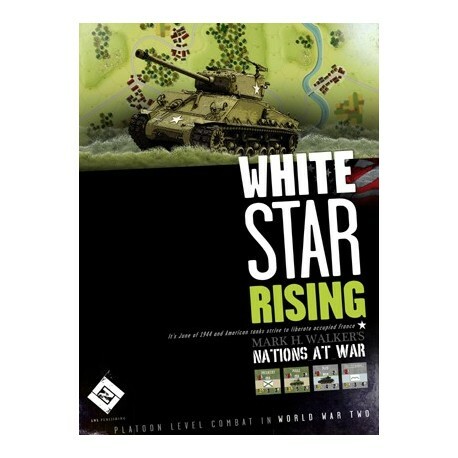 Premier jeu de la nouvelle série de Lock 'n Load "Nations at War" fortement inspirée de la série World at War. December 1944, Noville Belgium. Major Desobry had been ordered to hold the Germans at Noville, a small village several miles outside of Bastogne. The major, 500 men, and assorted remnants of a tank destroyer platoon, Combat Command A, and a battalion of Screaming Eagles face an entire German division. The Ludendorf Bridge was captured on March 7, 1945 by elements of the American 9th Armored Division. This scenario depicts the battle for control of the bridge. Located south of the larger town of Gey, and hugging the edge of the Hurtgen Forest, Strass was suppoed to be lightly defended. The men of the 330th Infantry Regiment would find out otherwise. Through assault and counter assault over a ten day period their regiment suffered 50% casualties. This scenario focuses on 11 December, 1944. The second day of the battle. June, 1944, Vierville, France. The men of the 101st Airborne Division failed to secure Vierville on D-Day. On June 7th it would be their turn to try again. By now they had some support in te form of a platoon of Stuart light tanks. The Germas, however, had some support of their own. It would be a long day for both armies. On the night of September 7th, 1944, Panzer Brigade 106 attacked the flank of the 90th Infantry Division. The ensuing battles were fought in several towns including Avril, Landres, and Mercy. In the end the men, Shermans, M-10s, and 57mm AT guns of the 90th had all but destroyed the Panthers and Grenediers on Panzer Brigade 106. There are 16 scenarios included. Units represent platoons of vehicles, such as M-10 Wolverines, M4A3E8 Easy Eight Shermans, and German Panthers, Tigers, and Mark IVs. 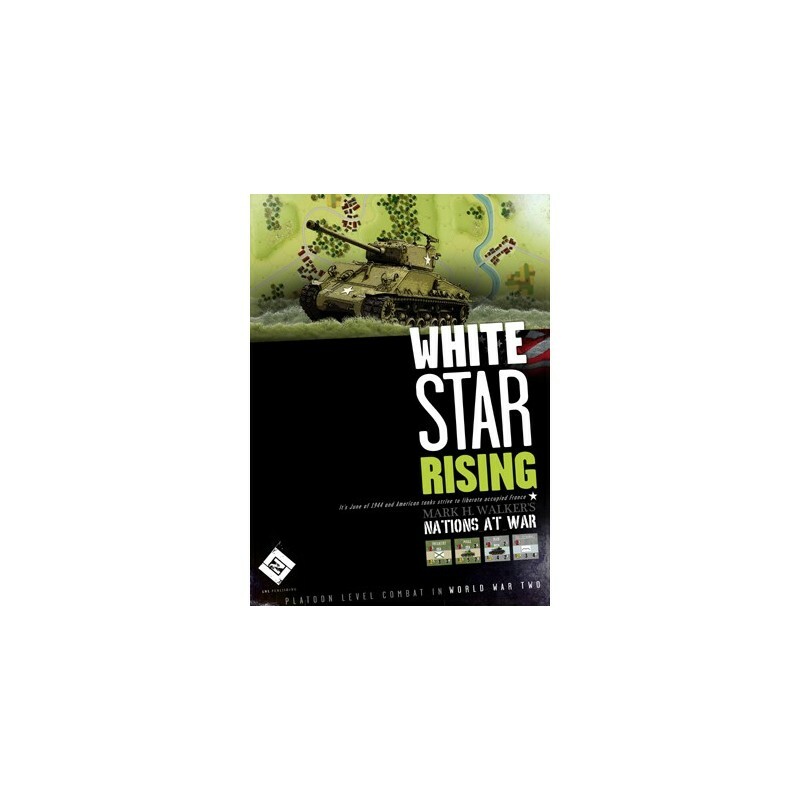 Of course White Star Rising isn’t all about tanks. There’s plenty of infantry; paratroopers, line doggies, Fallschirmjager, and Volksgrenadiers. In the same vein as the World at War system, the infantry are capable of moving fast and hitting hard. 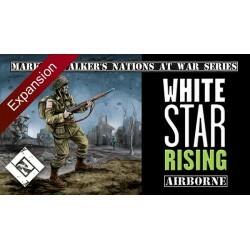 White Star Rising also includes support weapons, such as heavy machine guns, flamethrowers, and satchel charges that infantry platoons can use to lethal effect. The system throws typical turn-based gaming out the window. The platoons are grouped into formations (usually battalions and kampgruppe) andlead by a headquarters. Each unit of the formation must be within range of the HQ to activate with its formation. Although individual units might activate, and recon units can double their range from the HQ, but you’ll want to keep those formations together. The formations are activated by chit draw, and better-trained, better-led units can activate more than once in a turn, moving, shooting, and fighting in each activation. On the flip side of a coin, there is no guarantee that a formation will activate even once. The cup into which the formation chits are placed is seeded with end turn chits. When the second end turn chit is drawn the turn ends. Doesn’t matter if a single formations has activated; the turn is over. It keeps you on your toes. Combat. We love this combat system. When attacking each platoon rolls a number of dice equal to its firepower. Every die that equals or exceeds the “to hit” number (right superscript) hits the target. The target then rolls the number of die equal to its armor factor plus terrain advantages. Each die that equals or exceeds its armor factor negates a hit. The first hit disrupts a unit, second reduces it, the third eliminates it. Units may also close assault, entering the opponent’s hex to either deal a death blow or force him (or her) out of valuable terrain. Same procedure, but both units use their close assault value. The side that takes the most hits must retreat from the hex. Infantry is VERY good at this, especially against armor without its own infantry support. 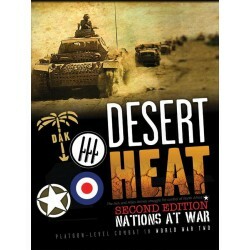 Game includes rules for thin-skinned vehicles, support weapons (actual counters that represent heavy machine guns, flamethrowers, and satchel charges that add to an infantry platoon’s capabilities), air-support, bunkers, wire, artillery, mines, overruns opportunity fire, line of sight rules that have been streamlined since their inception in World at War, transporting infantry, and all in eight pages of rules. 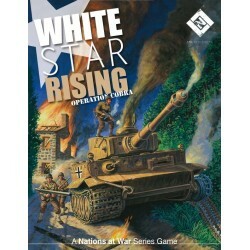 Operation Cobra est une extension pour le jeu White Star Rising. Il rajoute de nouvelles troupes (dont les français) et scénarios à ce jeu tactique simple et rapide. Wargame tactique sur les combats de 1943 en Tunisie. 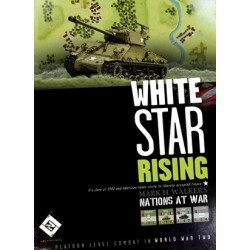 second jeu de la série Nations at War mettant l'accent sur des parties rapides, des règles simples et un matériel agréable.